Kristin Thorne has the story of a little dog with a big heart. SMITHTOWN, New York -- A three-legged dog named "Miracle" lives up to her name for the amazing tale of heroic actions that led her to save her young pups. But she's now hoping for someone else's goodwill in taking her home to their family. The 35-pound mix is now up for adoption on Long Island. Miracle's story starts last December in Orangeburg, South Carolina. Victoria McGonigal with Dochas n Gra Animal Rescue said a passerby found her near a factory that that had recently caught fire. She was taken to the shelter, where staff noticed two things: she appeared to have a broken leg and was still producing milk. At that moment, they realized Miracle likely had some puppies out there. But knowing how fire ravaged the plant, McGonigal said they feared the worst - that the pups died in the fire. Four days later, shelter workers wanted to see if they could find the pups. They went back out to the plant site with Miracle, and what happened next was nothing short of a miracle. The mother knew right where to go. She led the workers to a wooded area away from the building, where her six pups were alive and well. Miracle was so happy to see her young ones. This wooded area near a plant in Orangeburg, South Carolina, is where rescue workers say Miracle brought her pups during the fire, and they were found four days later. McGonigal said the workers determined that Miracle had been keeping her pups in the plant before the fire. When the blaze broke out, her motherly instincts kicked in. Miracle carried each of her pups to the wooded area for safety, but somehow hurt her leg in the process. Her front-left leg was badly injured and she was barely able to walk on it. This photo shows Miracle shortly after she was taken to a shelter in Orangeburg, South Carolina, in December 2016. Her leg eventually became infected, leading to its amputation. This photo shows Miracle and her pups after they were reunited at a shelter in South Carolina. The pups were adopted out a short time later. The shelter had her transported up to Happy Tails Dog Rescue on Long Island, to see if she might be a good fit for a family in this region. McGonigal said it's apparent Miracle had lived in a home with a good family prior to ending up in the plant. 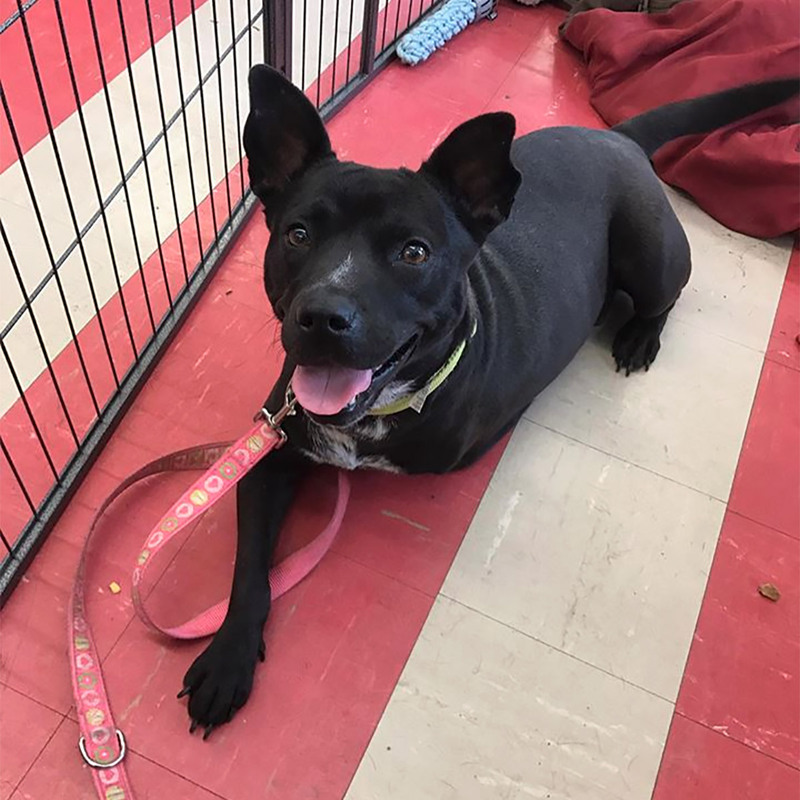 She has a great personality and would be great with any family -- one with kids, cats or even other dogs. "You can tell by her demeanor that she was so appreciative of being saved," McGonigal said. Miracle's six puppies are also on Long Island in foster-to-adopt homes, meaning they most likely will be adopted by their current foster families. Anyone interested in adopting Miracle should contact Happy Tails at 631-947-0030 or email Adopt@happytailsdogrescueli.org.